Home cleaning products, both homemade or commercial, should be handled with care in your home. After all, they all contain chemical and ingredients which could react with one another in bad ways, not to mention many of them are not good for family members or pets to ingest or inhale too many fumes. 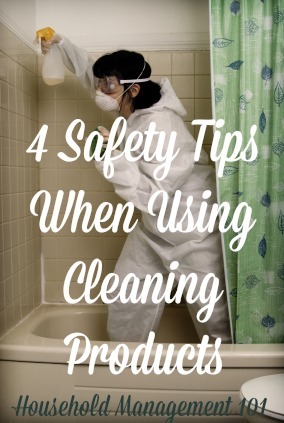 Therefore, below are four safety tips for your home cleaning products, to keep your home both safe and clean, at the same time. Another way to say this rule is to "use as directed." 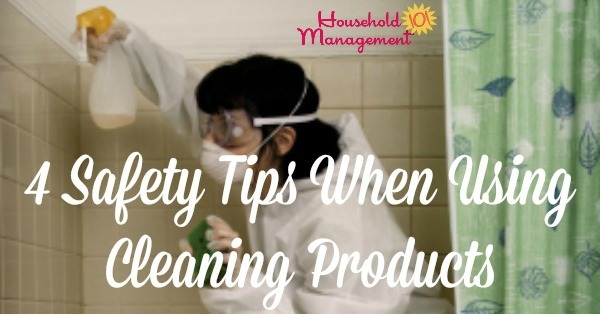 The cleaning product's label will tell you how to use it safely and effectively. What types of items do the directions say you can use the cleaning product on? What items the product specifically warns you not to use it on? Amount of the product to use? How long to apply the product (or how quickly to remove the product)? Mixing cleaning products can create dangerous and poisonous fumes. This is true for homemade cleaning products as well. For instance, do not mix chlorine bleach with either vinegar or ammonia. If you do it will create a poisonous gas. Keep your cleaning products away from children and pets, because many of them are dangerous if ingested or if they come in to prolonged contact with skin, or any contact with eyes. Keep the products in their original containers, so you know what they are and when the expire. If you need to dilute a cleaning product, or you make homemade cleaning products, be sure to label and date your containers. 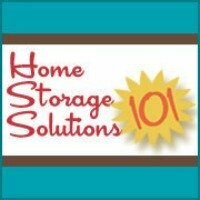 Keep your household cleaners away from food storage areas. You do not want to get cleaners and food mixed up or combined in any way. Store your household cleaners in a cool, dry place. When you finish with a cleaning product you need to make sure you dispose of it properly. Many times the label itself will explain any specific rules for disposal. Follow them (see Rule 1 above). Keep even empty bottles and containers away from kids and pets, so they cannot get into them. Consider putting them into a closed garbage bag or can, instead of an open wastebasket in your home. Do not flush disposable cleaning wipes down the toilet. Do not pour cleaning products down your sink drain or into the toilet. What's Your Favorite Cleaning Supplies, Products Or Equipment? Click here to share your favorites cleaning supplies with us, telling us what it is, and why you can't live without it. You can also read about what others have already said is their faves here.